you choose us for your repairs. most appliance makes and models. $30 Off your first service! Our goal is to complete appliance repairs in one trip whenever possible. We keep our vehicles well-stocked, and we’ll pick up parts before appliance repair appointments whenever they’re in stock with our local supplier. We’re insured and licensed to perform appliance repair in the San Francisco Bay Area by the California Bureau of Electronic and Appliance Repair. We guarantee quality workmanship and a friendly service experience. Over the years our service has received 100+ reviews on Google, Yelp, Angie’s List and other reputable business directories. Our reputation is important to us, so your total satisfaction with our service is our goal! Discount Appliance Repair is comprised of a team of appliance repair technicians serving the San Francisco Bay Area, including North Bay, East Bay, and the Peninsula. We’re able to provide same-day service on most days, and we take pride in providing streamlined services, quality workmanship and a professional and friendly appliance service experience. Our service area covers three regions — the Peninsula area from Daly City to Palo Alto, North Bay roughly 25 miles around Fairfield, and East Bay down to Walnut Creek, Lafayette and Alamo. We’re locally owned and operated and take pride in providing a personal service for Bay Area residents. Most of our calls are answered within 15 seconds, and the person who answers the phone is often the same person who will repair your appliance. Each of our technicians has undergone extensive appliance repair training — our goal is to complete repairs in one trip whenever possible. 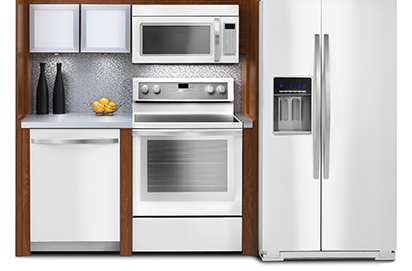 We offer appliance repair for all major brands, including: Admiral, Amana, GE, Kenmore, KitchenAid, Maytag, Sub-Zero Whirlpool, and more. Our technicians are experienced in servicing all types of appliances: refrigerator repair, freezer repair, oven repair, stove repair, range repair, cooktop repair, dryer repair, washer repair, dishwasher repair, and garbage disposal repair. Wanna learn more about us? Check out what makes us stand out from other appliance repair companies in the Bay Area.